Panoramic tour of Delhi, the Capital of the Indian Empire and nicknamed the "City of Seven Cities." Delhi, with wide tree-lined Victorian avenues has many faces depending on the neighborhood which is crossed. Morning visit Raj Ghat where Mahatma Gandhi was cremated, Jama Masjid, the largest mosque in India; visit theoldgloryof the Red Fort which was once the most opulent fort and palace of the Mughal empire and the bustling shopping district of Chandi Chowk. Then Visiting New Delhi Qutb Minar minaret, the tallest minaret in the world. Then Connaught Circus, the heart of public life in New Delhi, Rajpath and India Gate, Parliament and President House. 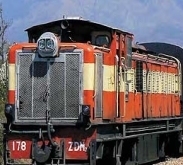 In the afternoon, transfer to railway station to board the "Awadh Assam Express" leading to Bikaner. Night train berths. Overnight on board. Morning arrival in Bikaner. Reception and transfer to the hotel for breakfast. Nicknamed the Red Bikaner, this city formerly an important important commercial center crossed by caravans from the Far East and Arabia, was founded in 1488 by a son of the king of Jodhpur. Today Bikaner retains its medieval splendor. Visit the Fort of Bikaner, Junagarh Fort built in the 16th century and the old city defended by impressive fortifications seven kilometers long. True unassailable eagle nest, this fort houses beautifully decorated palaces beautifully decorated. Bikaner is known for its camel farms considered among the best in the world and has a center, the Camel Research Farm, at the forefront of medical and genetic research. 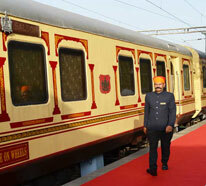 By late afternoon, transfer to the station to catch the "Bikaner Jaisalmer Express" to Jaisalmer. Night train berths. Overnight on board. Morning arrival in Jaisalmer. Reception and transfer to the hotel for breakfast. After some rest, visit this fascinating medieval city of yellow sandstone founded in 1156, lost in the depths of the Thar Desert. The city is built on a hill overlooking the desert, allowing him to watch over a large distance. Nevertheless, it is surrounded by a rampart of five kilometers with a hundred bastions. Jaisalmer has its historical importance and its wealth to its role on the stage caravan route between India and Persia, Arabia and the West. By late afternoon stroll on a camel in the dunes to watch the sunset. Overnight at hotel. Morning excursion to the cenotaphs of the rulers of Jaisalmer built in the former royal garden, located on a hill near a small lake below. Then back to Jaisalmer and visit two small Jain temples built in the center of the citadel. Recognizable by their stupas, they are adorned with beautiful and intricate carvings. Then, stroll through the old city markets and bazaars abound. 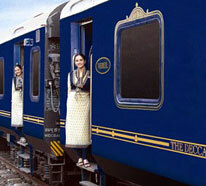 In the late afternoon, transfer to the station to get to Jodhpur by the "Delhi Jaisalmer Express." Evening arrival, reception at the station and transfer to hotel. Overnight at hotel. Visit Jodhpur, the Blue city, town famous for Mehrangarh Fort built in 1459 on a bluff overlooking the city from 125 meters. After passing several doors, one finds several palaces where lived the great maharajas of Jodhpur. This former capital of Merwar is nicknamed the Blue City because most houses in the old city are painted that color.Visit Jaswant Thada the royal centotaph. Beautiful white marble mausoleum in memory of Maharaja Jaswant Singh II, nicknamed the Taj Mahal of Rajasthan. Then walk to the fortified in the colorful and lively Bazaar, Sardar Bazar, around the Clock Tower. Overnight at hotel. Early morning transfer to railway station to board the 'Ajmer Jodhpur' train. Upon arrival at Ajmer, continue by road to Pushkar. Meaning "Blue Lotus" Pushkar is a holy place by excellence. As important as Varanasi, it has the privilege of having the only temple of Brahma, the Hindu god of creation. This site is exceptional for the provision of its crescent moon marble temples, which appear to float on the lake. Pilgrims come to pray throughout the year. Every year in November, takes place there one of the largest cattle fairs: the famous Pushkar Fair, where hundreds of thousands of villagers flock from everywhere to the great camel fair Overnight at. hotel. The morning walk along the ghats before hitting the road for Ajmer. Transfer to the station to catch the train "Ajmer Udaipur Express" reaching Udaipur. Evening arrival, reception at the station and transfer to hotel. Overnight at hotel. Known as the Venice of the East, Udaipur was founded in 1559 by Maharaja Udai Singh II in a plane perfectly mastered by defense and by Beauty, three sparkling lakes and green hills of the Aravalli. Visit the City Palace. Imperial with 250 feet of frontage, during his ceremonies beautiful fountains , apartments, and its rooftop garden welcomed the guests, this immense palace is a blend of Rajput and Mughal influences. It offers panoramic views of Lake Pichola and its two islands. Continue to the Jagdish temple of the 17th century and visit the Sahelion Ki Bari (Garden of honor Maharani ladies), an ornate garden fountains and marble kiosks. Then boat ride on Lake Pichola where you can admire the magnificence of the royal palace and the city. Then transfer to the Udaipur station and boarding the "Chetak Express" to Chittorgarh. Reception at the train station and transfer to hotel. Overnight at hotel. Chittorgarh, the ancient capital of Mewar, is the symbol of Rajput mind, bravery and faith and equally popular for Maharani Padmini devi the beautiful devout wife of Maharana Ratan Singh. Explore this impressive fortress considered the largest in India and the best preserved of the state of Rajasthan. It was founded in the 7th century and represents a symbol of heroism and Rajput resistance against the relentless attempts to invasions of Mughal rulers. This is where the Rajput warriors, repeatedly gave their lives, preferring death to dishonor and submission of the enemy. Today, the site, known as Chittor, lies majestically on nearly three hundred acres and contains many monumental ruins have largely inspired writers for centuries. In the afternoon, transfer to the station to catch the "Mandasor Meerut Express" to Bundi. Upon arrival, transfer to hotel. Overnight at hotel. Morning tour of the city with the fort and palace Taragarh. The fort, built in 1534, is accessible by an impressive gateway that provides a magical view of the surroundings. Visit the palace of Bundi the one which contains painted pavilions a gallery of murals in the turquoise and green hues that adorned the palace. Walk in the heart of a city where stands one of the finest wells degrees of Bundi, the Raji Ki Baoli. Overnight at hotel. Morning at the station in Kota transfer to take "Dayodaya Express" to Sawai Madhopur. Reception on arrival and drive to the Ranthambore National Park. In the afternoon, the first safari truck all-terrain open in the park. Overnight at hotel. Morning game drive in open truck in the park off-road. The former royal hunting reserve covers an area of ​​about 390 square kilometers where we discover forests, lakes and majestic plains. This park was created in 1955 to ensure the survival of the tiger and, of course, many other species that sustain this large predator: chinkaras, and other chital deer, wild boar, etc. We also see leopards, hyenas, jackals, bears, monkeys, crocodiles and a large number of birds. In early afternoon transfer to Sawai Madhopur Railway Station and ride aboard the "Indore-Jodhpur Ranthambore Express" to Jaipur. Arrive late afternoon and transfer to hotel. Overnight at hotel. Morning visit the Amber Fort situated a few kilometers from the city. Amber was the capital of Rajasthan before being dethroned in 1728 by Jaipur This former fortress built atop a rocky outcrop, is available on elephant back or jeep. Back to Jaipur and visit the capital of Rajasthan. Jaipur, or the Heart of Rajput chivalry, built in 1727, is known as the Pink City because of the color of its walls. Visit the City Palace and its magnificent museum containing many treasures, the Astronomical Observatory and its amazing instruments that still admired today. Judgment to the legendary Palace of Winds, Hawa Mahal, with multiple openings. Built in 1799 and close to the City Palace, this amazing architectural fantasy was built for the women of the royal families so they can attend the processions without being seen. In the afternoon, ride pedicab to take the pulse of the old city of Jaipur where markets wisely aligned under the arches along the avenues and colorful bazaars shopping abounds. Overnight at hotel. After breakfast, drive to Nahargarh, the Tigris fortress built by the Maharaja for his new unofficial women. Panoramic view of the pink city. Then visit the Jaigarh fort. Very nice collection of weapons of Maharaja with the widest cannon on wheels in the world. In the early afternoon, transfer to Jaipur railway station to board the Express to Delhi. Welcome on arrival and transfer to the airport for the return flight. Ideal location in the heart of Delhi at Connaught Place. Quality services and courteous. Decent rooms and spotlessly clean. The hotel offers all the modern comforts for a 3 * hotel. Charming haveli which was converted into a hotel by a couple of tour guides. The Indian family which is the caretaker is warm, attentive and informative. Very clean rooms, rustic, very well decorated. It just feels at home.